The SCAI 3D system can easily be used together with the Alpha Stabilized Camera head provided by Dagsljus and opens up new dimensions for your creativity. Our ability to simultaneously fly both camera and performer opens up the field for amazing shots otherwise impossible without our system. Head weight 55lbs (25kg), max payload 150lbs (68kg). 3D capable. We talk about the SCAI 3D system and describe how it works and what it can do. The finished product of the shoot we did in Estonia. 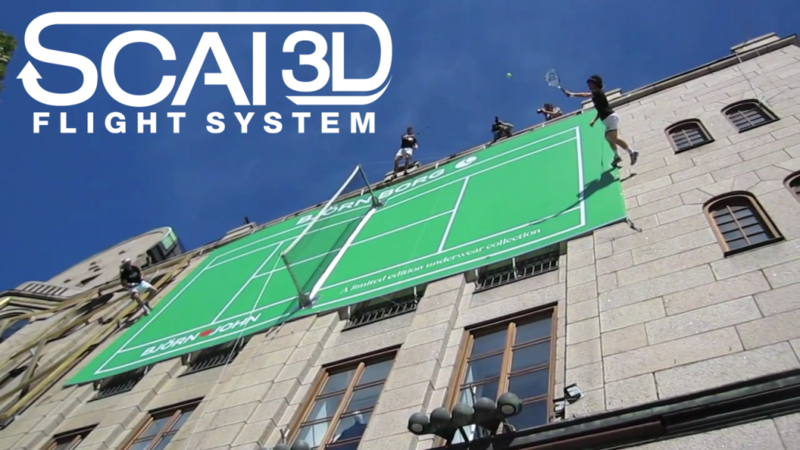 Svenska Stuntgruppen was responsible for all the side tracking shots, which were accomplished using SCAI 3D. Fly performers or cameras in three dimensions. By connecting our high speed winches to our software we control and program flight paths that can be altered, and then simulated, to provide desired results. Our ability to simultaneously fly camera, props, performers etc. opens up the field for amazing shots otherwise impossible without our system. Using SCAI 3D can not only save time but also offers multiple shot iptions once everything is rigged – not to mention amazing tracking shots and camera angles. All this without the need to change anything regarding our set-up. Stunts (jumps, falls, drags, supernatural power etc.) can be perfected using the system and – perhapts best of all- we can easily do the same scene over and over again until everyone is satisfied with the final result.